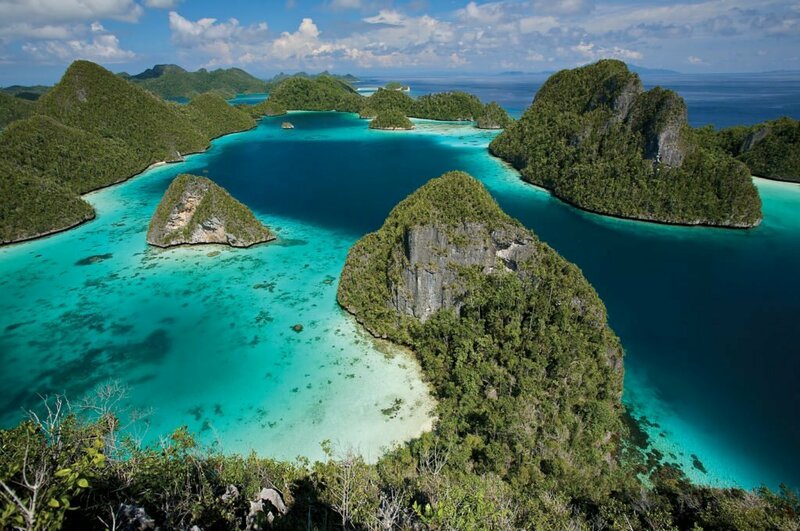 Are you planning to visit Raja Ampat? Do you want to dive the most iconic dive sites? Are you trying to decide where to stay? With a private charter on board El Aleph you’ll decide your own schedule and dive Raja Amapat’s best dive sites – when you want to dive them. 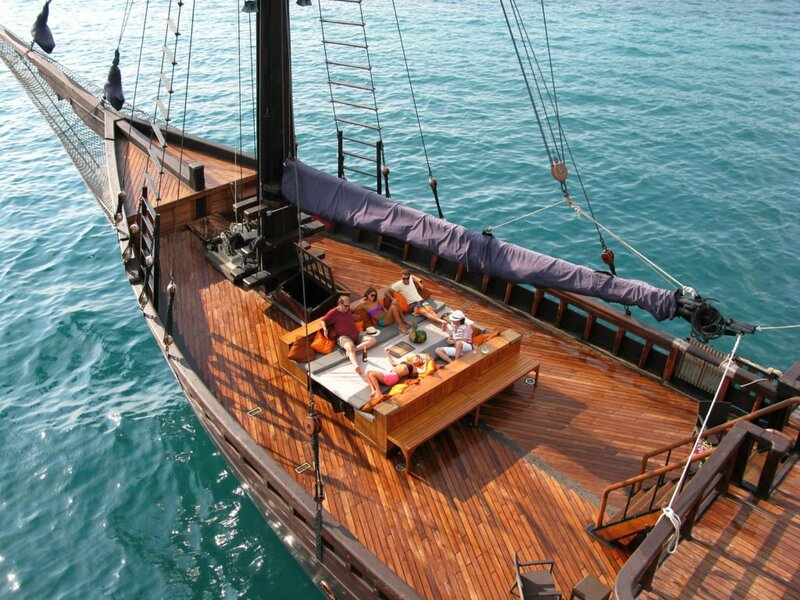 El Aleph offer the most luxurious liveaboard facilities in Indonesia and you won’t need to take in to account anyone else’s schedule other that your own. Private charters on board El Aleph allow you to go where you want, when you want so you’ll be able to explore the sites around the Dampier Strait, the Fam Islands, Misool and more. 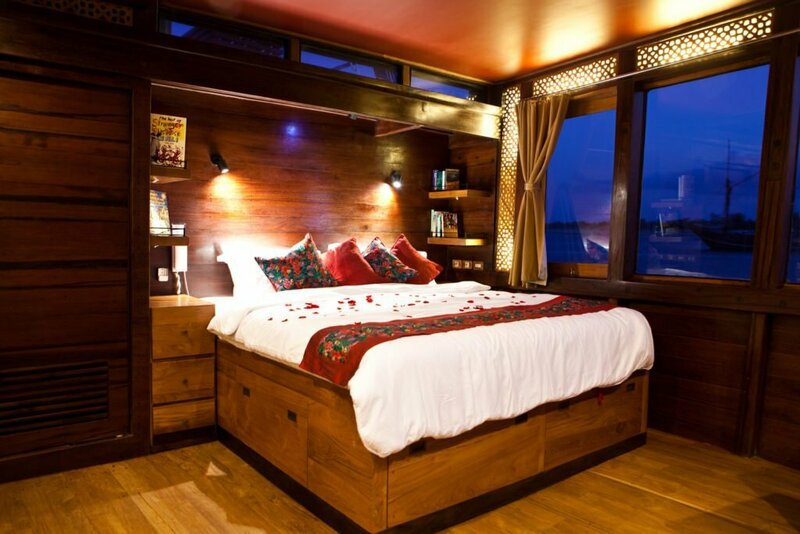 Your friends, family and loved ones will experience the 5 star floating hotel luxury that only El Aleph can offer. Combine your diving with treks through lush tropical rainforest, look out for birds of paradise, make foot prints on virgin white sand beaches and snorkel in crystal clear waters – Raja Ampat is heaven on earth and yours to explore. Cape Kri is the site where Dr. Gerald Allen is famously reported to have counted 374 species of fish in one single tank dive and once you have dived here it is a number that is easy to believe. Cape Kri offers excellent biomass, phenomenal diversity and some interesting currents. The entry point is on the southeast side of Kri island where the top of the reef offers a picturesque shallow coral garden comprised mainly of hard corals interspersed with sandy patches and which is a great place for watching passing turtles feeding on the reef. The drop off is a little further out and gives way to a steeply sloping reef offering a mix of both soft and hard corals down to 40 meters. As with many Raja Ampat dive sites where the current hits the reef is where you find the majority of the fish and Cape Kri fits the formula – schools of fusiliers dart back and forth whilst hoards of damselfish glitter against the reef and glassfish schools seem to almost shroud the bommies. Look out to the blue for patrolling giant trevallies, Spanish mackerel and hunting tuna, on good days white tip, black tip and gray reef sharks are also seen. Finish your dive in the shallows on the reef top for the safety stop. The gradual ascent working your way along the reef provides for numerous macro and critter opportunities; scorpion fish, nudibranchs and fans with pygmy sea horses are just some of the smaller highlights amongst the multitude of reef fish that flit in and out of the corals. Cape Kri promises a bit of everything and delivers on all counts!! 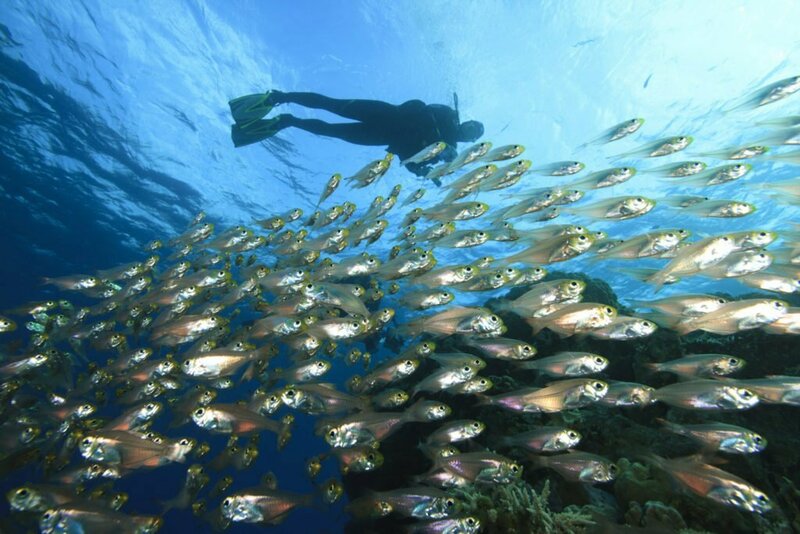 The Passage is both an iconic and unique Raja Ampat dive site which sits between the island of Waigeo and Gam and runs roughly on an east – west axis. The stretch of water between the south coast of Waigeo and the north of Gam ranges in width from approximately 20 meters to 40 meters and the maximum depth is 15 meters with an average depth of only 5 to 10meters but this site is extraordinary. The coasts of the islands which form the passage are dotted with outcroppings of mangroves and the trees which grow on the banks of the islands lean over the passage forming, in places, a canopy over the narrow stretch of water. The passage resembles a jungle river far more than it does a dive in the sea but that is the exquisite nature of this site; it is a melting pot of jungle and reef. The passage itself is almost 1 mile long and in places the coral and rock formations almost breach the surface. The dive is best after 10am, tides permitting, as after this time there are spectacular sun beams filtering through the leafy canopy which make for some excellent photography opportunities. Diving the Passage really is a special experience which should not be missed and when timed right it is suitable for all levels. 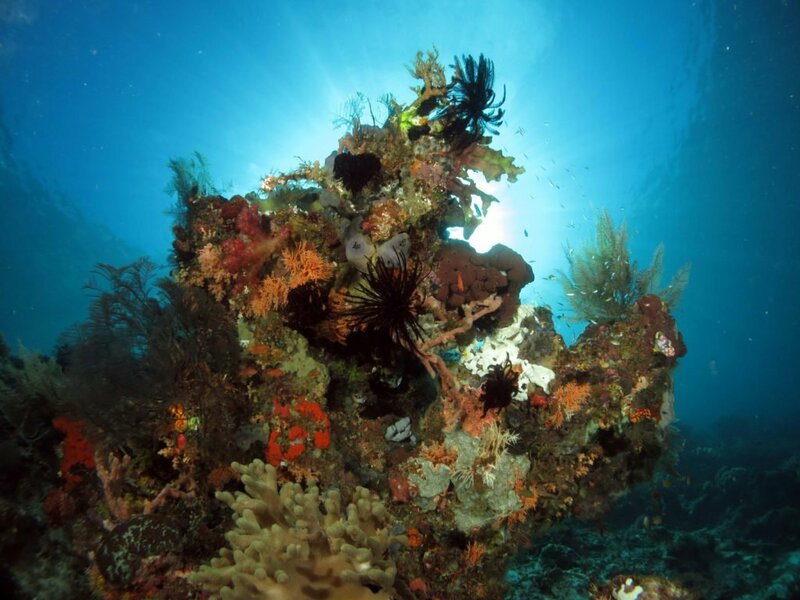 Sardine Reef is a dive best suited to divers with a little more experience, particularly in currents and especially when diving around new moon of full moon when currents tend to run faster. For those who dive Sardine Reef though it is a rewarding dive with schools of fish so dense that they can block out the sunlight from overhead. Sardine Reef is a small submerged sea mount, the top of which sits at around 5 meters before dropping off into a sloping reef which extends down to just shy of 30 meters. The name “Sardine Reef” refers to the tightly packed marine life found here – schooling fusiliers, trevally, chevron barracuda and jacks are hard to distinguish amongst the chaos in the blue. Predators are drawn to the flocks of smaller fish and grey reef sharks and both white tip and black tip reef sharks are frequently seen here in numbers, as are Spanish mackeral, large napoleon wrasse, pick handle barracuda schools and passing hawksbill turtles. Corals here are a healthy mix of hard and soft corals and there is an abudance of sea fans which boast pygmy sea horses – it is possible to spot bargibanti, Denise’s and pontohi in one dive. This is an excellent dive for sheer biomass and for those who like current diving; when timed right this is an exhilarating dive bringing with it numerous large schooling fish sightings. This submerged seamount is located just under 10km north east of Kri Island and on a day when the current is running it provides for excellent biomass, pelagics including a range of shark species, oceanic manta rays (in the season), barracuda, trevally and tuna. Not only is there an action packed scene in the blue but the mount’s plateaued top boasts healthy and diverse corals alive with smaller fish and critters including pygmy seahorses, frogfish and nudibranch. This site can be a thrilling dive from start to finish and with the possibility of manta rays, sharks and hunting pelagics combined with a range of critters it is hard not to get excited about diving here. Craggy and rugged above the water but with layers of schooling fish it is full of color and life beneath. The topography is a mix of wall and steep sloping reef with a shallow water soft coral garden; both coral and fish are abundant. Large green turtles are often seen here as are vast schools of red toothed trigger fish out in the blue. The wide variety of corals on the reef means that macro life is plentiful and similarly varied – look out for orangutan crabs and nudibranches and the sporadically scattered fans are also worth investigating. 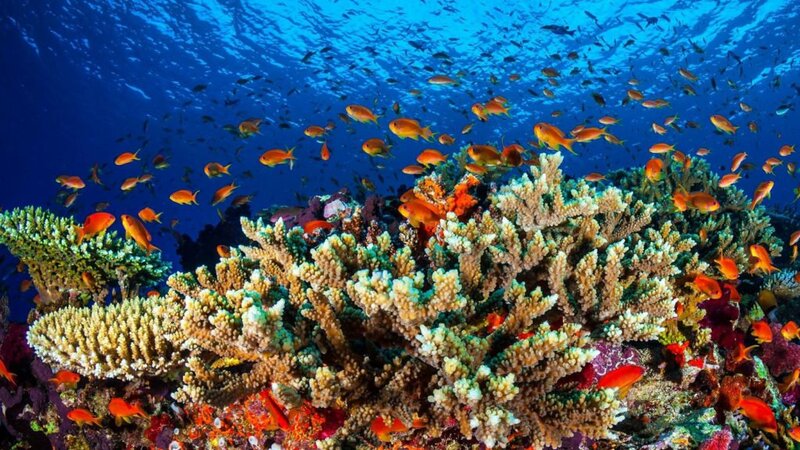 Damsels and brightly colored antheas adorn the shallow water soft corals; colorful and jewel like against the backdrop of the blue. Fiabacet not only has an interesting topography but also abundant soft corals, an array of mixed fans and impressive schools of juvenile fusiliers, surgeon fish and damsels glittering like colorful gems in the sun. This site typifies some of the best traits of Misool diving, the soft corals grow densely and a wide variety of species is showcased. In the shallow water Fiabacet really comes to life – colorful tubers, fans and sea squirts cover the reef crest whilst damsel fish and fairy basslets catch the light from the sun as they dart in and out of the reef. Breathtaking scenery with an abundance of life that is hard to match. NB: Fiabacet is also the name given by some operators to the underwater ridge which connects Tank Rock and Nudi Rock). A sloping reef and wall dive with huge macro diversity, phenomenal light blocking fans and an abundance of healthy soft corals. 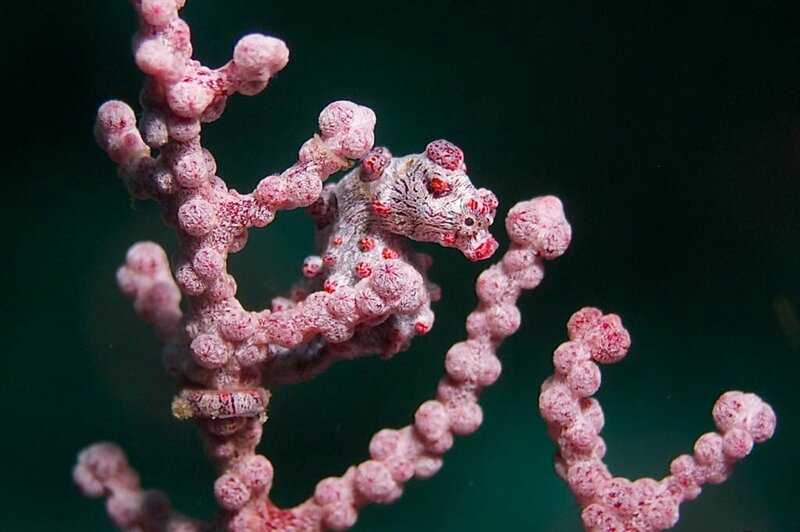 The site is around a rocky island on a steeply sloping reef (to the east) with predominantly soft corals, tubers and small fans, which harbor pygmy sea horses and coral shrimps, growing from sandy ledges. On the north side of the rock the reef topography changes and becomes more of a vertical wall. The wall supports much denser coral growth and the gorgonians here cast shadows as they block out the light from above. Huge black coral ferns hang out from the wall providing shelter for schools of cardinals and sweepers. Recessed caverns are scattered across the wall in the 20 meter upward levels and are good for checking for crustaceans. Keep an eye out to the blue for schooling bat fish and fusilier and don’t forget to look overhead – the sheer volume of fish life is breathtaking. 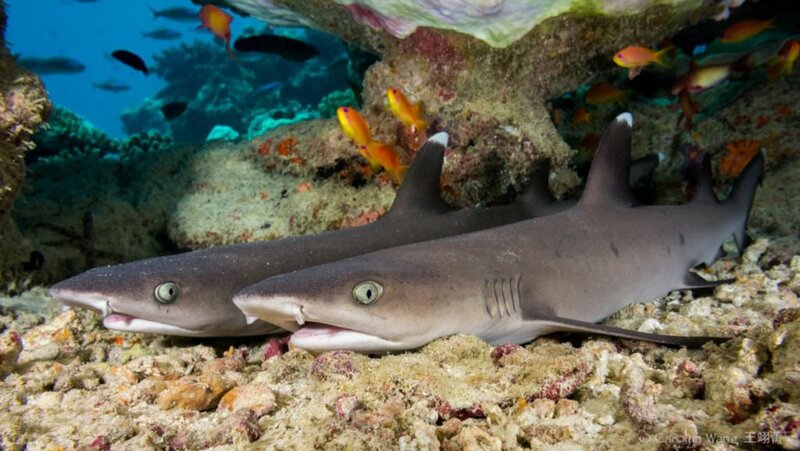 A topographical melting pot based around a sea mount featuring sloping reefs, walls, ridges and pinnacles which give the birthday cake it’s ‘candles’ – the site is renowned for shark and pelagic sightings, remarkable biomass, extreme coral diversity and kaleidoscopic colors. The Birthday Cake is a submerged sea mount around 50 meters out from the south side of the largest Island of the Boo. Descending down the mount there is a wall to the west and sloping reef to the east. The sheer volume of biomass here makes this dive an awesome experience – on a good day both vertical curtains of glass fish and horizontal ribbons of juveniles stream past. 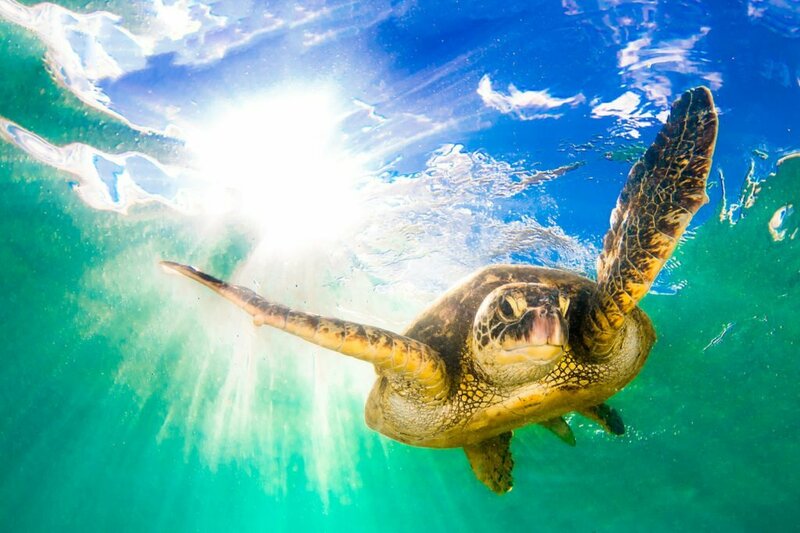 Keep an alert eye out to the blue – sharks patrol the mount and turtles are also frequently seen here. Looking into the reef there are numerous vertical faults and crevices and horizontal ledges which create shadowy areas for critters and nocturnals to hide out in. The most stunning part of the birthday cake has to be heading back up the ridge to the shallows – pinnacles adorned with soft corals and small barrels and table corals taking up the spaces in between. The shallow water and sunlight make these pinnacles truly the ‘icing on the cake’, vivacious colors made seemingly even more intense by the surrounding contrasting blue water – an amazing locale for your safety stop! This is a Raja Ampat site that really does live up to its name – manta rays at a cleaning station, patrolling white tips, sheltering wobbegongs, big tunas and hunting trevallies – anything is possible around this sea mount and it’s ridge – definitely a site for looking into the blue! Usually one side of the ridge will be subject to current but the other side will be comparatively sheltered. 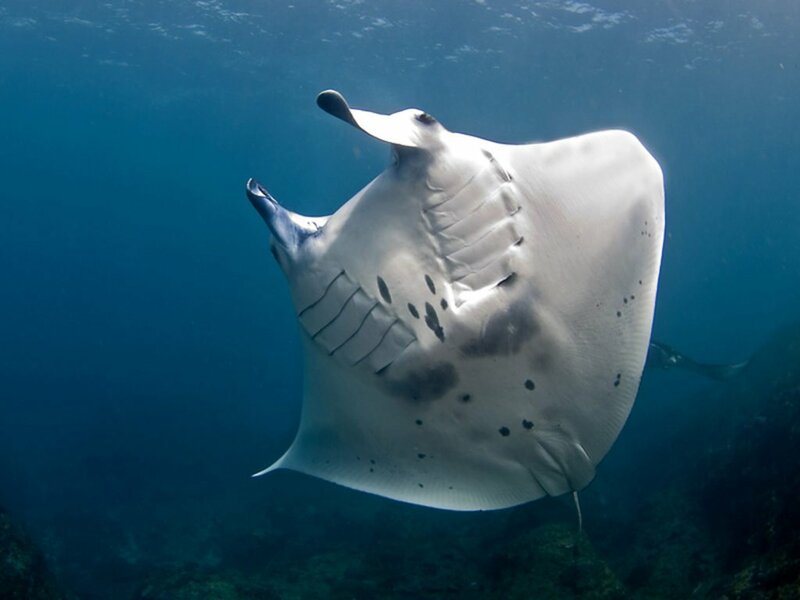 Head out along the ridge to the raised cleaning station and approach with care – mantas will continue to clean despite divers being present – if not spooked. The cleaning station attracts mainly reef manta rays but passing oceanic (birostris) are not unheard of. Keep an eye out to the blue of the current side of the ridge – the currents attract schooling fish and patrolling white tips in numbers – giant trevally and tuna also hunt here. The plateau does not fail to impress either with rugged, brightly colored, coral encrusted pinnacles which attract schools of fairly basslets, juvenile fusiliers, golden sweepers and cardinal fish sheltering from current. Around the base of the pinnacles there are craggy boulders which wobbegong sharks hide underneath and mantis shrimps, stone fish and morays inhabit shaded crevices and dug outs. This is a Raja Ampat site not to be missed – mantas, sharks, big predators, some decent currents and a kaleidoscope of colors. A stunning wall with impressive corals dominated by enormous sea fans which really make this a breathtaking site. Gorgonian passage is a narrow passage running North to South between the islands of Wayilbatan and Walib. The fans are the reason for diving this site and will impress even the most seasoned of divers – particularly in the 10 – 20 meter range on the north end where they stretch to almost 3 meters across. When any body of water is pushed between two narrow points there is usually some current here running from one end of the canyon to the other so stay relatively close to the wall. The vertical curtains of sweeper fish and glass fish gathered against the walls are good indicators of current changes! At around 25 meters where the sand begins look out for bottom dwellers such as scorpion fish and forests of garden eels. Make your way up the wall as you progress along the channel, whilst the fans are clearly the highlight of this dive there is other notable marine life – bat fish and sweetlips can be found under many of the ledges of the wall, schools of glassfish hide out behind and in the fans and macro marine creatures including ghost pipe fish, coral shrimp and nudibranches can all be found here too. This Raja Ampat dive site is given its name due to the shape and appearance of the rock pinnacle which is visible from the surface – do not be misguided though – this is definitely a site for larger pelagic lovers! Do not be surprised if the wall is not your focal point here – from the surface down there can be schools of fish in the blue water column from fusiliers to triggers and schooling banners, don’t forget to look up – great barracuda often school below the surface. Patrolling pelagics are often a little further out keeping the smaller swimmers in check; white tip reef sharks are frequent visitors here. Heading east along the wall at around 22m a ridge is formed which runs from Nudi Rock to nearby Tank Rock, after crossing the ridge there is a rubble and sand area at 25 meters which extends around the eastern tip and then meets the sloping reef on the south side of the rock. The shallow waters are also full of life and a variety of hard and soft corals; table corals, boulder coral and plates provide ledges for scorpion fish, a variety of shrimp, eels and hoards of Misool’s usual colorful reef fish. A small seamount site where epaulettes sharks are known to frequent at night plus some other interesting nocturnal marine life. The top of the Epaulette City sea mount ranges in depth from around 9m to 15m and is littered with various formations and pinnacles. 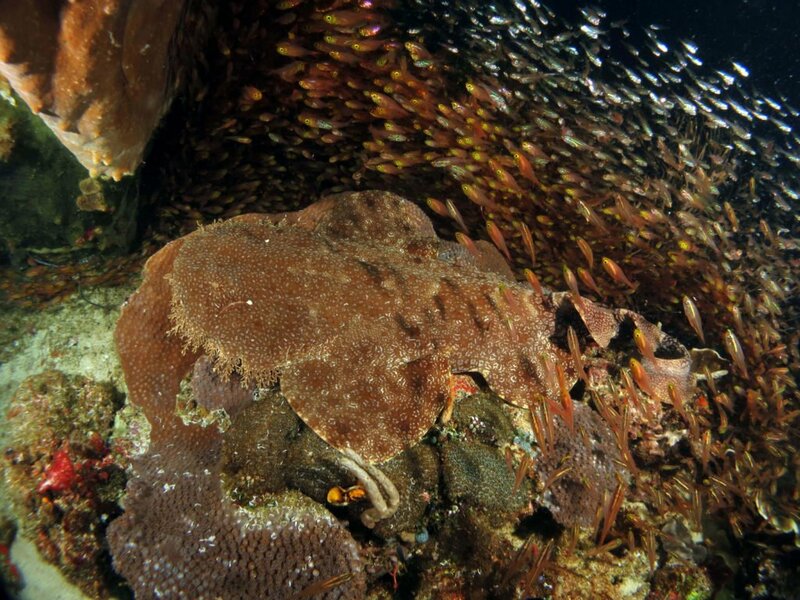 The plateau drops away on all sides to a sloping reef beginning at around 15 meters. The top of the mount is predominantly a hard coral mix of tables, other branching corals, some boulder and plates with a smattering of small soft corals filling in the spaces in between. 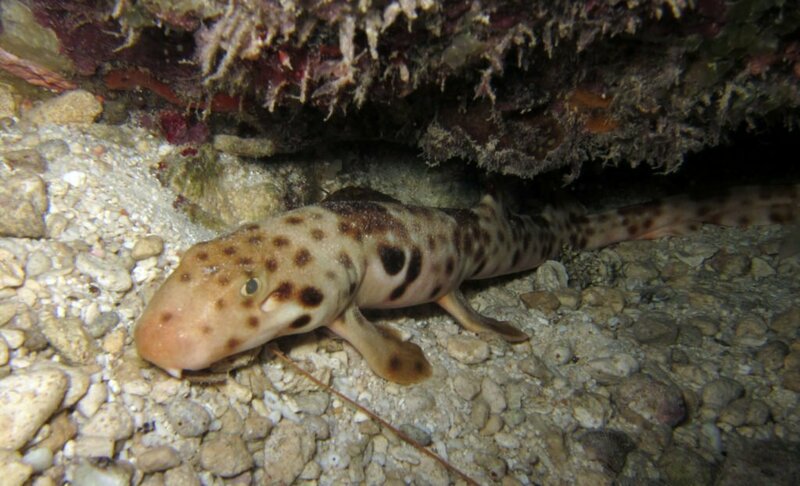 Epaulette sharks are the primary reason for diving here and whilst these are a non-swimming species of shark they still move fast, particularly when under torch light which will send them looking for cover. The sides of the mount provide a hunting ground for larger species including black tips, so a look over the edge is worthwhile. Aside from shark life the site is a good site for sleeping turtles, a range of crustaceans and look out for schooling bat fish overhead that seemingly follow divers around the mount. Phenomenal topography, schooling marine life, hoards of fish, critters, pelagics and swim throughs – Boo Windows is an iconic Misool site and it has it all! The site is situated around the two small rocky outcroppings on the most eastern tip of the Boo island chain. The two rocks are connected underwater by a ridge with a sloping reef dropping away to each side. The name Boo Windows comes from the two aquamarine swim throughs just below the surface on the larger rock. The topography of this site is what makes it remarkable The boulder formations and pinnacles around the southern tip of the ridge are completely encrusted in short bright soft corals and sea squirts and as you round the smaller rock the sheer volume of fish can make it hard to see your buddy it is that abundant! Schools of sweepers, glass fish, juvenile fusiliers and damsels stream past in the current whilst in the blue triggerfish , barracuda, trevally and other predators hover menacingly. The shallow waters are sublime with scorpion fish, shrimps, lion fish and sweetlips adding to the rainbow of colors. This is a site which could keep you occupied and wanting more, dive after dive after dive. With El Aleph privately chartered you’ll be able to explore Raja Ampat’s most iconic dive sites at leisure. Enjoy cruising around this remote location and pick when and where you’d like to dive. 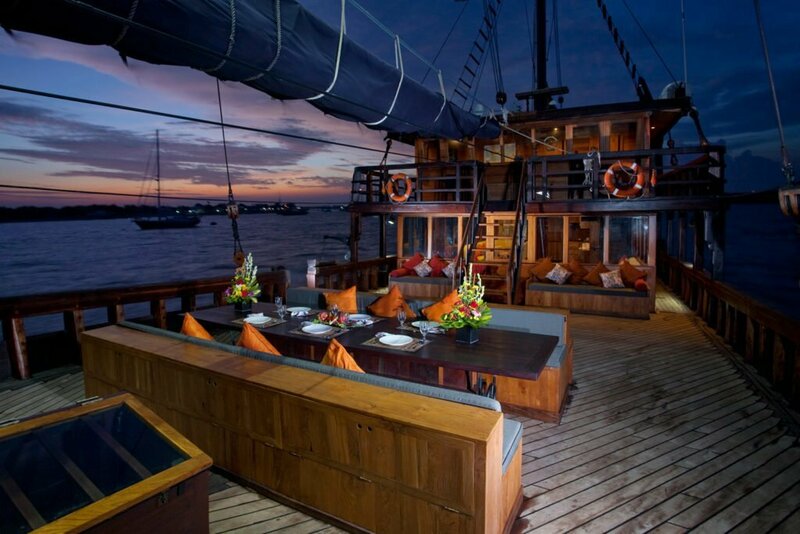 In between dives relax on deck and experience the luxurious facilities that only El Aleph can offer. El Aleph was built to be enjoyed by her owner who has a keen eye for detail, an appreciation of the finer things in life and who wanted a vessel which offered unprecedented luxury, space and comfort. As a result, El Aleph was built to the highest specifications possible, with no expense being spared. When we describe the living space on board as luxury, it’s not something we say lightly. 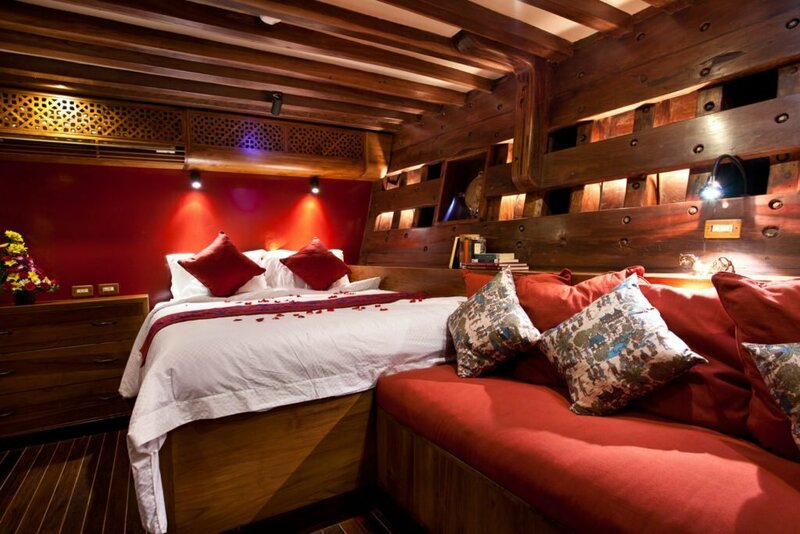 El Aleph has been beautifully handcrafted in 100-year old teak and ironwood, every feature has been thoughtfully incorporated to ensure a lavish design and layout unsurpassed by any other Phinisi schooner ever built. From the polished wood finish to the state-of-the-art electronics and navigation suite no aspect has been left to chance in ensuring your comfort, safety and enjoyment during your exclusive Raja Ampat cruise. For more detailed information about El Aleph, view our full vessel specifications. To enquire about our rates and availability or to book your Raja Ampat cruise on board El Aleph please contact us on: info@elalephcruising.com.